Thought I'd try a little numenorean civic statuary, in this case Earendil slaying Ancalagon the Black (dragon not quite to scale) which I imagine would be an endlessly popular subject in numenorean art, comparable to (and greatly resembling) the myriad depictions of Saint George and/or Michael the Archangel, which dot Europe. 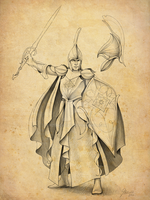 I like to think that in the mid-to-late second age, as numenor turned away from its friendship with the elves and reverence for the powers in the west, Earendil (who had always been greatly important to the Numenoreans) was now elevated to near-godlike status, and his story somewhat recast in more independent and singularly heroic terms, emphasizing "Earendil the human hero and dragon-slayer" (and of course, "father of the line of kings") while downplaying "Earendil the half-elven messenger to the Valar." 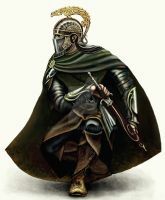 His armor and gear (as is often the case in medieval/renaissance art depicting ancient or biblical scenes) is in the contemporary style of the time in which the sculpture was made; several thousand years after Earendil lived, and very little resembling what he would have actually worn. the dragon (besides being, as I said, rather embarrassingly downsized) was based mostly on dragons as they appear in late Medieval/early Renaissance statuary and, like those, was largely assembled out of bits and pieces of other creatures (a long snake neck here, crocodile body there, throw in some ram horns for good measure) the artist, like most numenoreans, never having actually seen a dragon in real life. the tilt of Earendil's head is a bit unsatisfying to me; I was hoping to have him looking down his nose at the beast pinned underfoot with that sort of aloof, contemptuous calm you see in a lot of classical art, but it didn't quite translate. That said I'm overall pretty happy with the way this one turned out. I can picture it in some grand square in Armenelos, or centuries later, gathering barnacles at the bottom of the ocean. Ugh, poor Ancalagon, what did he do to deserve that? He didn't even survive the only battle he was employed in! Sad though  he is my favorite dragon. Sorry that I cited this work here. Nothing to be sorry about thanks! Awesome! I actually like to imagine that the artists of Dale eventually began doing paintings of Bard shooting Smaug in a sort of reversal of the Michael vs Lucifer style: The Dragon above, the Piercer below! I might even try to draw that, but I still have long ways to go! Hey man, you're amazing. I love so much the idea of Numenor and love dwelling on it in my readings of the Silmarillion. Do you think you could take a stab at drawing Armenelos? I can never find any good depictions of the greatest city of Tolkien's ancient world. The picture is really well rendered, and reading the description... it makes perfect sense. Especially with the idea of Numenor's visualization of Earendil changing throughout the years. I like how that and the idea of St. George being Earendil plays out in the drawing of the sculpture. I also like Ancalagon's scales and wings, and how Earendil looks a little... Roman, almost, with that armor. It just reminds me of Rome, for some reason, though I feel that I'm way off track with that, actually. I personally design Numenor as Greek for the early years, and perhaps Phoenician for the middle-years, but Rome makes a lot of sense too, especially for Numenor's later years. And I've seen a lot of parallels (both in books and movies) between the Byzantine Empire and Gondor. Thanks for the links! Exactly. Turin especially, linked with Sigurd. Very statuesque! You got it right. The texture and lighting are great, but you slipped a little in the anatomy, and that goes right into my eye. Anyway, killer art, as always. Hey ! That's the last piece I didn't comment Here we are ! So I really like the idea of the "St George/Earendil", that's brilliant. It remembers me a conversation I had with someone on a forum : he was asking me why the dwarves didn't kill the Dragon themselves, I answered, like Gandalf do in the book, that there was no real hero among the dwarves and that only heroes can kill a Dragon. Someone popped up and said that, in his opinion, it was cause of a "cosmic impeachment" : Dwarves cannot kill dragons, only Men can. We had a long argument, I said that Earendil was not really a Man when he killed Ancalagon, as the explanation on the choice of the Half-Elves is before the War of Wrath (even if it's not explicitely said that it happen before or not I think). But another member prove me wrong, or at least partly wrong : Tolkien did write something like "and the Dragons will be killed by the hands of mortal Men" ! So there was this idea that only Men can really kill Dragons, even if they can be injured by other races (Dwarves and Elves). On another aspect you talked about with Gabbanoche : I like the shields he posted, the long ovaloïds one. I think the classic roman shield is too much "roman" in our minds and that pushed us out of ME, a lot more than the saxonic Rohirrim. It's not "Tolkiennian" if you know what I mean. That was the only problem with your Mumak : the shields on the side made me think at first "but how a Mumak could have fought against romans ?" May be other people used this type of shield and may be I'm thinking that cause of Hollywood, but still... go for more classic and more 'saxonic' oval or round shields. And now I'm waiting for the next thing to comment on ! it seems fitting that a feat of purely temporal, beowulfian heroism like "dragon slayer" would consistantly be man's territory. also it's not hard to imagine why men; rugged, impudent, individualistic, hotblooded, unlearned, full of 'heart,' (not to mention bearded) could win a elven woman's affections, leaving her infinitely wiser, older, more responsible but also kind of boring elven suitors eternally friend-zoned. I have not much things to add But thanks for the thougts and quotation, and also for the laugh with the final "elven suitors eternally friend-zoned" That was a good one. Another more serious aspect of that is the fact that men's leader are always lords and not kings during the First Age : doesn't seem like an equal treatment to keep them as vassals. On Helm I always envisioned him as an ambivalent character of course : brave but impulsive. He is basically the one who declared the war. That's how we made it in our game : the best warrior Rohan had but a unreliable leader, acting as a champion and not as a king and general. In the same time he did fight a great threat : Rohan at this time is probably not powerful than during the War of the Ring and while some people on Wikipedia evaluated Saruman's army to be the size of Rohan's full strength, Helm was probably fighting 1 against 2 or 3 (fighting renegades, dunlandings, corsairs and easterlings in the same time). Fantastic. I love the connection to St. George and the Dragon. (dragon not to scale) haha yes... Wonderful sketch, though! It does have a classical look to it, certainly. You really got into the subject here, and it shows! I marvel at the amount of tone and shading in the image, since it is all pencil! I wondered at the scale involved, then decided that didn't matter, since the great public works were often duplicated in miniature for private enjoyment. No doubt the original is indeed gathering barnacles on the seabed, but a smaller copy could be decorating a garden or chamber somewhere in Gondor. I understand your reservations on the pose, but it looks good in a neo-classical or socialist heroic style. The Saint George sculptures I remember from my classes and encyclopedias tended to look rather posed, while your statue seems to worry less about showing a man smiting a monster and focuses more on the message in the man. Ancalagon of course has been shrunk in perspective, to keep the image in, well, perspective. (As a gamer I'd often thought as a young D&D fan that Saint George had successfully padded his rep by bagging a 3 HD junior-sized dragon.) Not to mention that there wouldn't be enough bronze in the world to accurately depict Ancalagon in 1:1 scale. The legends also has St George subduing the dragon first and then having the maiden lead it to the town square by her girdle, where it is publicly dispatched. Since our modern fantasy dragon seems mainly incapable of being restrained in such a fashion, the beast in question was somewhat underwhelming from that POV. One might well still accept the destructive capabilities of a 2-3 meter length dragon, something definitely worth smiting, but it wouldn't be a twentieth part of the Rushing Jaws. For scale I thought of it being similar to Michelangelo's "David" or his (destroyed) "Julius" for the truly imperial scale for Earendil. Of course, a 2:1 increase size ratio for a proper Numenorian-heroic style half-elf hero might easily attain that size! The sculptor might well have been hailed a master for this work, presuming he was not one already. That was what made me think it could have been replicated in 1/200 or 1/550 scale as an ornament in a fine house in Gondor somewhere. The statuette would be an heirloom of the House, a conversation piece par excellence, with the memorial of the splendor and pride (and folly) of Atalante, and a memorial of the heroic Elder Days to the Faithful. Lovely, lovely! This just feels real, as it was in front of the King's Palace, or in a square in Armenelos (maybe as a fountain), anyway, its great and has a clasical feel, nearly roman, that it's brillaint, while attaining a Saint George vs Dragon scene. I really like the spear-sword combination, as it gives more movement, action, pathos, to the statue, with a shield it would be more static and hero-defending-from-dragon-attack, while you wanted a hero-slaying-dragon-for-breakfast feel. Such, I like the pose and the gestures. The dragon is just perfect, it has a medieval demon touch, which I think you could have emphasized more. The greek styled helmet is a hit, a reminiscence from the First Age, a hit shared with the armour, with those roman elements attached, and combined with that great Renaissance breast-plate. The cephalopodus/marine feel is also well done, and niiicely done, specially the pauldrons, wich look like those prehistoric molluscs. The shading and the tecnique is trully depurated and perfected, it feel profesional, you really put lot effort on this. Two critics: The head, as you say the pathos is lost here, maybe it should look more downwards, or maybe if it doesn't have a helmet, with the hair blowing in the air, would be more convincing. The body is in motion like a sea wave or the blowing wind, that fits Earendil, but the face alienates the focus in the artwork a bit, that's a shame because it's nicely drawn. The other one, I think it has a very intricate shape, which I like, but does fit a bronze statue? How would the cloak be hold? The pauldrons? Just my humble opinion. Maybe it would also be nice this design as two different statues, each with it's own pedestal, with Earendil spearing the dragon as union. Maybe the people could walk below, being both colossal. Just my thoughts again. I love this artwork, a trully nice concept art, worthy of WETA. Added to favs. Waiting for your new Tolkien's sketch. I kind of like the comparative lack of pathos in the face, it's something you see in alot of classical and medieval art, and speaks well to this concept of the supremacy of man over the ancient and monstrous (as i've said elsewhere, i consider the numenoreans to be a very "apollonian" culture) but even still the head is a too rigid and just plain not at the right angle. i was so happy with how the helmet came out, that i didnt want to risk changing it. again I'm glad you're enjoying this one, and thanks alot for your kind remarks about my pencil work. I've got some things brewing and hope to have them up soon. Looks great as always mate! altho i would think it would look cooler if he had a shield instead of a sword, would look more "accurate" since it is the "shield arm". P.S. Really dig his Pauldrons! Then you, according to me would still have that mighty but still "posh" appearance Late Roman armor and equipment is a very "Posh and mighty"! I still like your Karma/Hoplite helmet very much! tried to do it again but whit a Germanic feel? maybe go with a Hoplite "top", chainmail neck guard and some romanesque Chin guards? i dunno....it seem really hard to get the Karma to actually look seriously, don't you think? yes i agree. the numenoreans, more than anywhere else (except in the south an east) are where i give myself a break in terms of the overbearing anglo-saxonness of tolkien's vision (given his illustration of the karma, tolkien seems to be inviting such a departure) but even in their case i think a little saxonizing is nescesarry. i think of the 'saxon overlay' of middle earth as being sort of like how bards or storytellers in the ancient past, when describing a foriegn people to an audience of their own people, would describe the forigners, their gear, their buildings, their customs, in terms and idioms that the "home team" could understand. the numenoreans, as described in lotr seem like how the britons or the saxons of the 7th or 8th century would describe the (even then) ancient romans.